Tennis courts may be universally designed in the same way, but their topographic location can change the entire look and feel of playing the great game. 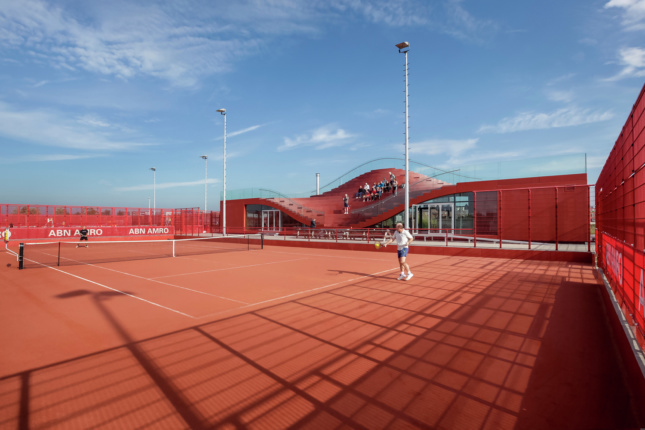 In honor of the US Open, we’ve rounded up some of the world’s most architecturally impressive courts. 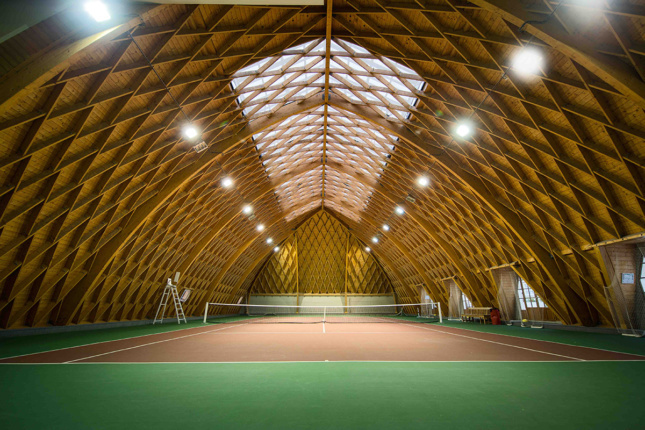 From the ever-imaginative buildings within the United Arab Emirates to the secret spaces of Paris, these amazing athletic facilities placed in unbelievable settings feature inspired designs that date from present day, all the way back to the late 19th century. 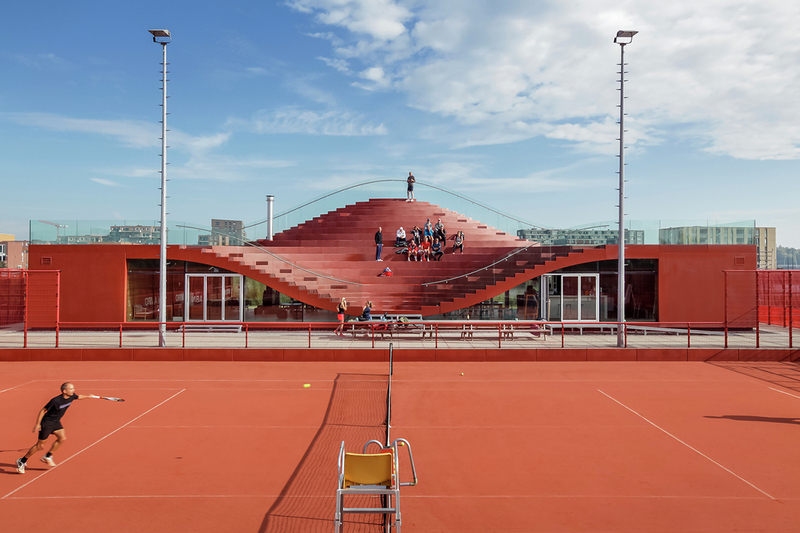 The IJburg Tennis Club near Amsterdam houses 10 clay courts, a tennis school, and a temporary communal building with integrated rooftop seating designed by Dutch firm MVRDV. Acting as a giant piece of street furniture, the red-sprayed concrete structure features a curvaceous roof that dips down towards ground level on the south side, while the north side rises 23 feet high, allowing for bleacher-like seating overlooking the courts. The wood-clad interior boasts ample natural light thanks to wide glass that spans the front and south sides of the building. Burj Al Arab Tennis Court, Dubai, U.A.E. 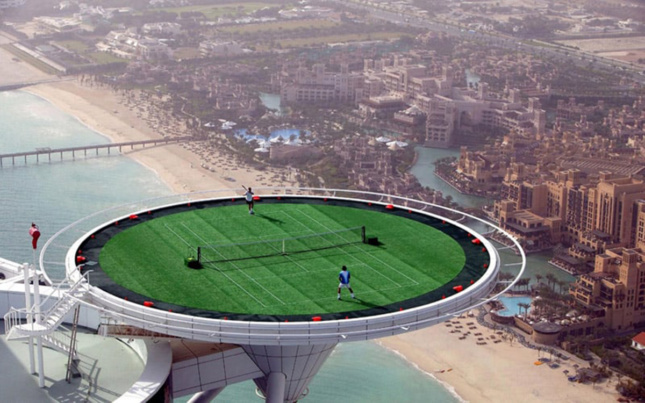 Twelve years ago, Andre Agassi and Roger Federer held an exhibition on the helipad of the Burj Al Arab, the third tallest hotel in the world. Designed by Tom Wright of WKK Architects, the structure stands like the sail of a ship at 1,053 feet tall. The helipad covers 4,467 square feet of space and a grass court was laid out across it for this one-time match. Since its completion, the site has been home to other iconic sports moments: Golfers Tiger Woods and Rory McIlroy teed off of the helipad in separate years while Formula One racecar driver David Coulthard performed donuts on the surface in 2013. Dubai could also soon build the world’s first underwater tennis complex off its coast in the Persian Gulf, a vision by Polish architect Krzysztof Kotala, founder of 8+8 Studio. Set on the sixth floor of an art deco building with an Aston Martin dealership at its base, this hidden tennis club sports weathered wood paneling and a dramatic, honeycomb-style arched roof. The building itself, designed by famous French architect R. Farradèche in 1924, includes a close-up view of the Eiffel Tower which can be seen from the balconies of the club. The hard court was established as a national monument in 1986 and features 1,400 pieces of wood that shape the parabolic interior design. This private tennis pavilion is situated within the historic upstate guesthouse and casino of John Jacob Astor IV. 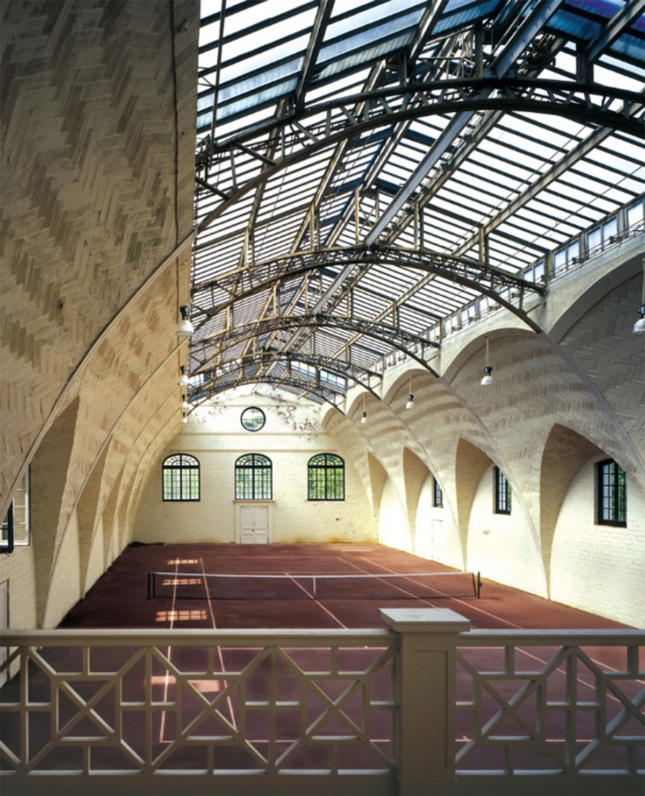 Designed in 1902 by Stanford White, the indoor and outdoor sports complex included squash courts, a bowling alley, a shooting range, and an indoor swimming pool. It was designed in the style of the Grand Trianon, a château found at Versailles in France. After being purchased by its current owner in 2003 for over $3 million, PBDW Architects rehabilitated the 20,000-square-foot mansion where Chelsea Clinton and Marc Mezvinsky were married in 2010. 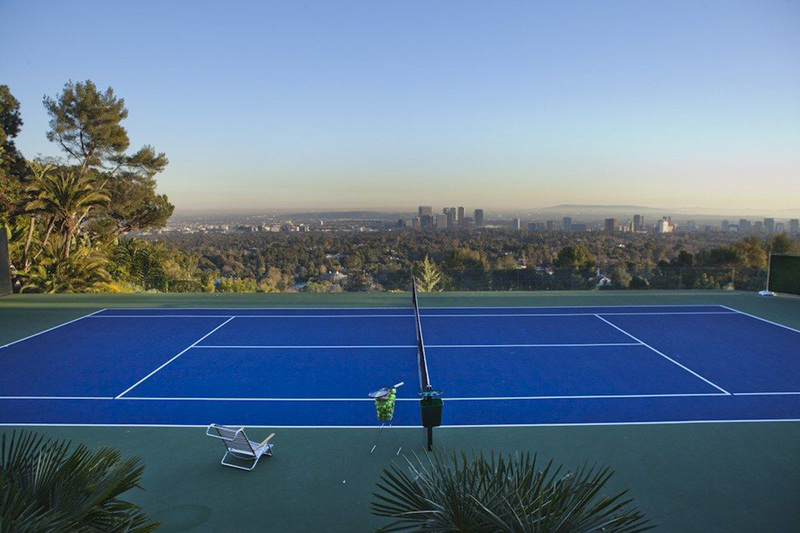 Located at the John Lautner-designed Sheats-Goldstein House, this seemingly floating tennis court provides spectacular, sweeping views of Los Angeles. The house is currently owned by the colorful real estate investor, NBA lover, and fashion designer James Goldstein and was recently acquired by the L.A. County Museum of Art as its first-ever architectural acquisition. When Goldstein bought the property in 1972, he began working with Lautner on several updates and additions to the house. The on-site, infinity-edge court was designed atop a three-level entertainment complex built in collaboration with Lautner’s colleague. It features a glass partition barely visible from the other side of the outdoor space. 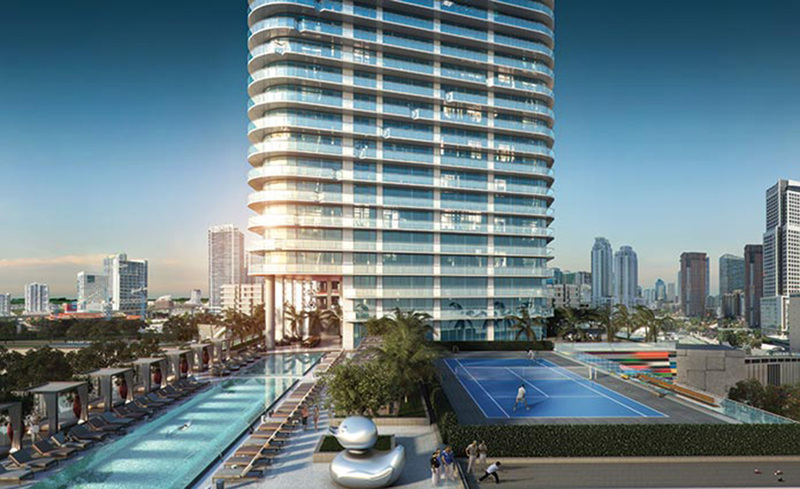 Arquitectonica’s design for the just-completed SLS Lux Brickell Hotel and Residences in South Beach includes a multi-use sports center atop the ninth floor of the 57-story tower. Tennis courts, a rock climbing wall, as well as spaces for volleyball, basketball, and more, allow the residents of the building’s 450 luxury condos, 12 penthouses, and 84 hotel rooms an opportunity for ample play. The base of the building features a colorful, 40,000-square-foot mural on its exterior by Fabian Burgos, a world-renowned Argentinian artist who creates optical designs for architecture. Since the 1960s, a secret has existed within the walls of New York’s famed Grand Central Terminal: It houses a secluded tennis club. For over ten years, city dwellers could pay to play at the original Vanderbilt Athletic Club, founded by Hungarian athlete and refugee Geza Gazdag. The club housed two clay courts and a 65-foot indoor ski slope built on the third-floor Annex of the train depot. Since Gazdag was priced out of his lease, the coveted piece of real estate began a fraught history of ownership. Donald Trump took it over for three decades, turning it into an elite club for the city’s wealthiest tennis fans. Once his lease ran out in 2009, the space became a lounge for the Metropolitan Transit Authority and new courts were built on the fourth floor where current owner Anthony Scholnick manages the facility.